My Kitchen Aid mixer has faithfully served me for almost 20 years (best wedding present ever). Biscuits are the fastest~I can mix them and cook them in less than 30 minutes. Cornbread comes next at about 35 minutes from start to table. Pizza bread, about 45 minutes. And of course, the rolls take 60 minutes, or less. I have been successful at shaping 24 rolls, cooking half, then freezing the rest. I have also used left-over cooked rolls for bread pudding--yum! 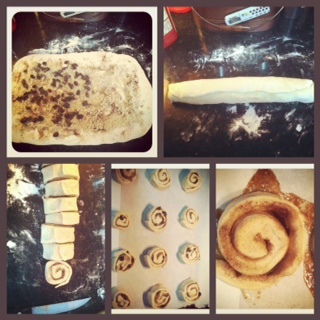 My favorite though, is to make 12 rolls for dinner, then make 12 cinnamon rolls for breakfast next morning. Combine milk, water, & butter in small saucepan. Heat over low until liquids reach about 120°F to 130°F; butter does not need to be melted. *If you overheat the liquids, just pour them into another container and they will cool off quickly. You can also heat in the microwave, just make sure you stir well before testing temp. as microwave tends to heat liquids unevenly. Place 2 cups white whole wheat, 1 1/2 cups white flour, sugar, salt, & yeast in mixer bowl. Attach bowl and dough hook. Turn to Speed 2 and mix 30 seconds. Gradually add warm liquids to flour mixture, about 30 seconds. Mix 1 minute longer. Continue on Speed 2, add remaining white flour, 1/2 cup at a time, until dough clings to hook and cleans sides of bowl, about 5 minutes. Knead on Speed 2 for 3-5 minutes longer. Place dough in a greased bowl, turning to grease the top. Cover; let rise in warm place, free from draft, 15 minutes. *At this point, you'll want to set aside half of the dough for tomorrow's cinnamon rolls. Wrap in plastic and put into a zip-top bag with as much air removed as possible. This will keep it from over-expanding. It will still blow up a bit in the bag, but no worries. Turn the remaining dough onto floured surface. Divide in half; then divide those halves in half. Divide each of the quarters of dough into 3 equal pieces. You now have 12 lumps to work with. Shape as desired. I usually just round up the lumps a bit and call it good. Line a baking sheet with parchment paper. Put dough pieces evenly on the sheet, cover with towel, and let rise in warm place for 15 minutes. Pre-heat oven to 425° during this rise. Bake (12-15 min) at 425°. Remove from pan and cool on wire racks. Once dough has risen to almost double, turn out onto floured surface. Work the dough into a rectangle shape, about 16" wide by 8" high. Brush rectangle with soft/melted butter. Sprinkle all over with cinnamon (1-2 tsp depending on your preference). Sprinkle brown sugar and raisins evenly over cinnamon. Beginning with the side closest to you, roll up the rectangle, longways, into a nice tight log. Using a very sharp knife, cut the log in half. Cut those in half. Now cut each quarter of log into three equal pieces. Place rolls, cut side up, evenly spaced on a parchment-lined cookie sheet. Cover with a moist paper towel or tea towel and let rise 15 minutes. While rolls are rising, heat oven to 400°. After 15min rise, when oven is heated, cook rolls on middle rack for about 10 minutes. Don't overcook as you want the middle to be a bit soft and gooey. While rolls are baking, make the icing. In mixer, beat cream cheese and butter until creamy and blended. Beat in vanilla. Slowly add powdered sugar, beat well until smooth and fluffy. Remove rolls from oven and let cool slightly. Frost with icing (about 1/2 TBS each). Messy Mondays ~ My "Desk"
Thrifty Treasures ~ Save the Needlework!